It all started at 3:30am. 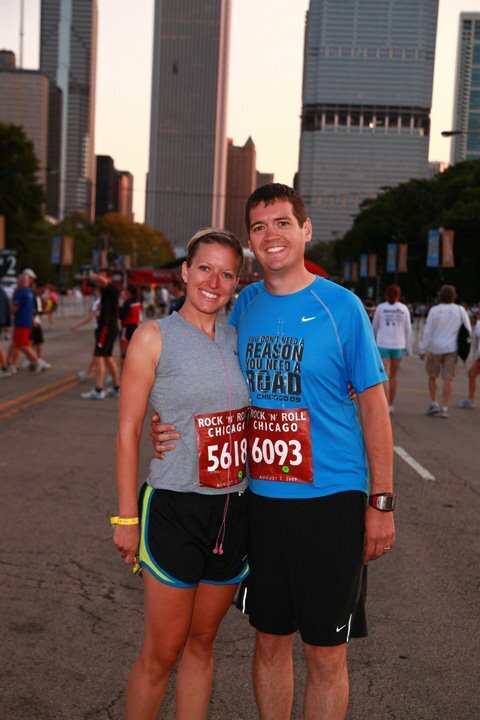 We were up to get ready for the half marathon! Being out of town meant not having a usual breakfast, a peanut butter crunch Clif Bar. We got on the road at 4:30am, not certain how packed the decks would be, we decided to get their early and wait it out. Parking was a breeze and not packed at all. At 5:30am we made our way to the starting area. The temperature was awesome, 62 degrees and an early morning sunrise. The corral area was well organized by groups of a 1,000 with a 1 minute break between each corral. We heard them announce Kara Goucher. It was so cool that she was there to race. I think she ended up winning the WHOLE thing with a 1:08:05! We heard that she out kicked at guy at the end too. The attendance was over 14,000 runners, our largest race yet and it was surprisingly not crowded feeling. Starting out on Columbus Rd helped too as we took up all lanes at the start. The first 5 miles were around town then we head south until mile 8.5, where we turn and make our way up the bike path along Lake Shore and back to the parks for the finish. Rob and I hung together for the first 3 or 4 miles and then he took off ahead. I got to shout to him on the turn around at about mile 8.5 “Go baby go!! Go Rob!!”. During the race there was water, cytomax, Gu and wet sponges. I had 2 servings of shot blocs (margarita flavor) along the race, but it must not have been enough. That coupled with my not normal breakfast, I started to feel very nauseated at mile 10. I was thinking I could very well get sick. My pace unfortunately slowed. At mile 12 I normally wouldn’t get water being so close to the finish, but feeling sick was very strong. I slowed to get a drink and that was enough for my right IT band to seize up. I had to hobble the rest of the way, which wasn’t fun. I should have worn my knee brace. 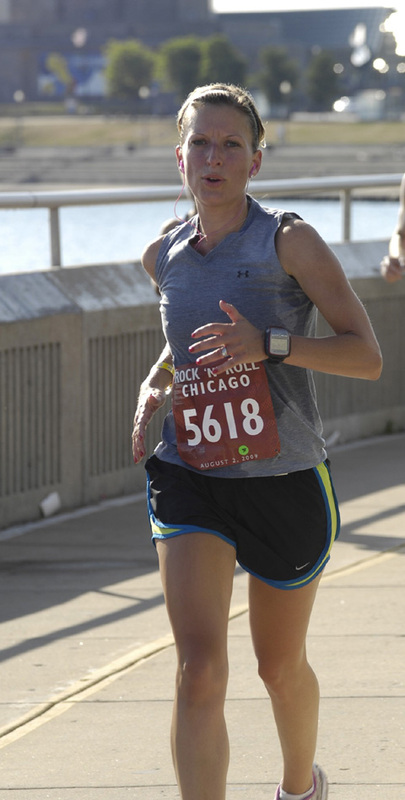 I was so excited about not feeling pain from my thigh/groin/hip area that I ignored that my IT band may get fussy like it did at IL half marathon. I will definitely start wearing it in longer races. A lesson learned too was just like forum posts have told me, the Garmin will not keep pace in the city. So for the full marathon I will turn auto lap off and hit lap at the mile markers. That won’t help with getting pace info in the city, but at least I’ll have some data after the race. This was Rob’s first half marathon and he did great!! 1:53:54 I’m so proud of him!! Post race was well organized and had the best post race stuff. I grabbed and orange and popsicle. They also had frozen towels which felt amazing. We went to the MGD 64 tent to get our two free beers. I got through 3/4 of one and I was ready to head back to the hotel to check on doggie. I left this race feeling like I had more in me so I hope to keep plugging away at it and see if I can get my time down more. The USAF Half Marathon is up next. I think it has hills so I’ll have some work to do. 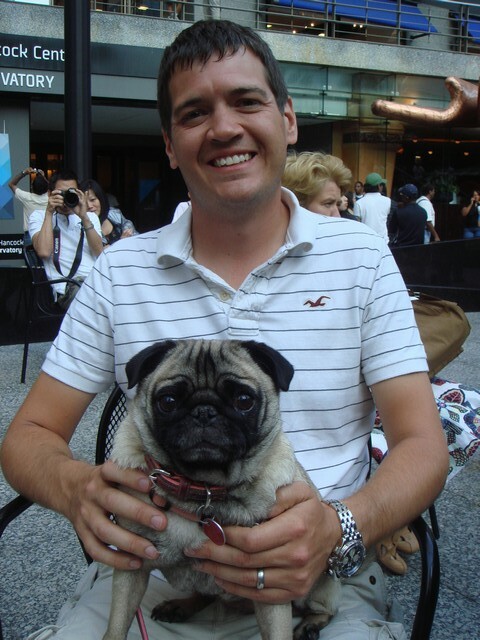 Later that day we took Coco out for a walk and hung out by the water fountain at the John Hancock. 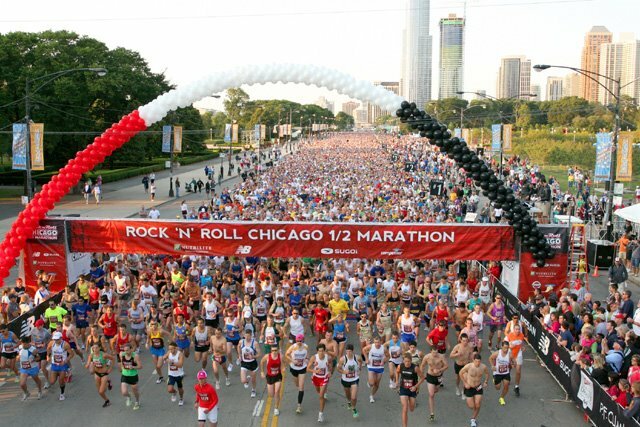 Categories: Chicago, Half Marathon, Race, Rock and Roll Chicago Half Marathon, Travel | Permalink. You're such a rock star! Congrats on the time! congratsssss on the awesome PR!!! WOW! 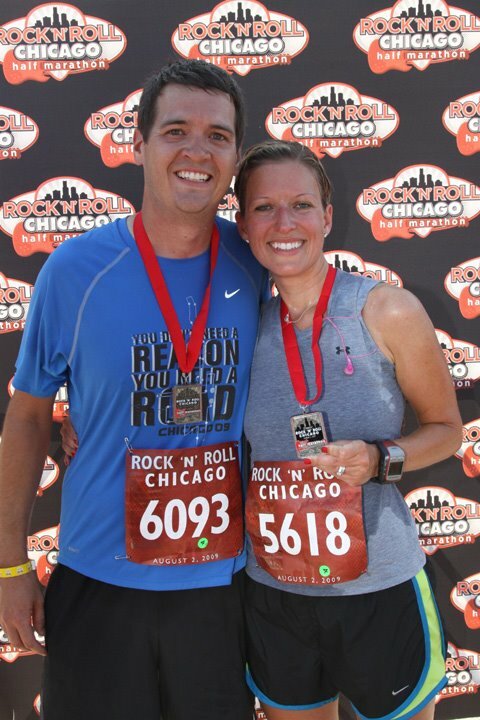 For not feelins so hot around mile 10, you still had a smoking fast time!Big Congrats to you, and Rob! Congrats!!!! I'm so happy for both of you 🙂 You guys both have been working so hard and for you both to have awesome races is just great!! Also…. I'm SOOOOOOOOOOOOOOO jealous that you got to go to the Cheesecake Factory…. my fav!!!!! Wonderful job though to both of you!! You are a machine! Congrats! Way to go on the PR! 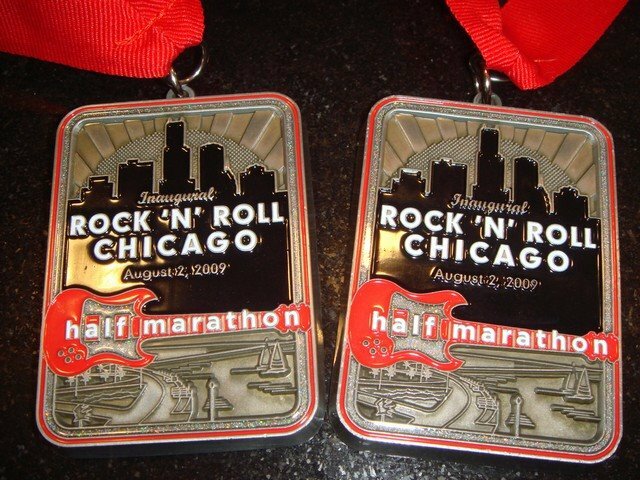 I would have loved to have run this race as a warm-up for the Chicago full. 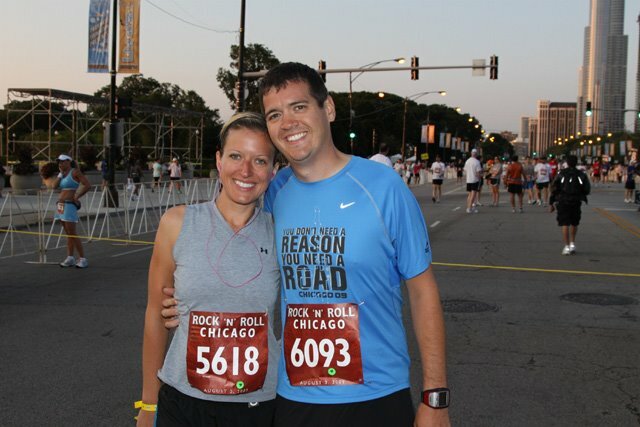 Thanks for sharing this awesome race report. omg AWESOME! 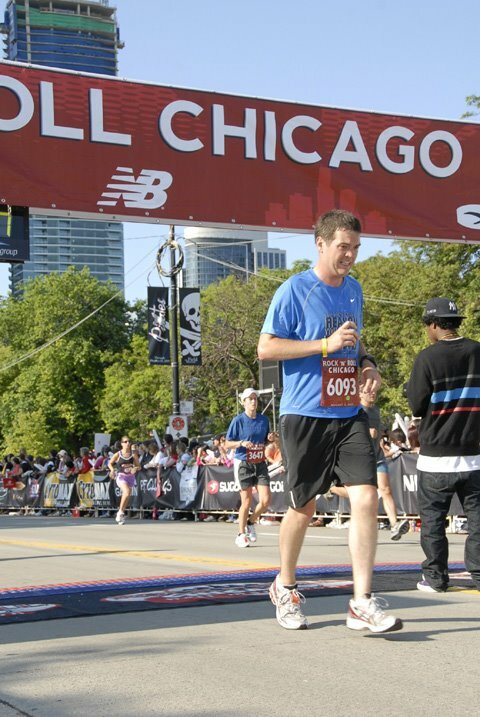 Hey how come my race pictures never look as cute – not fair. Haha. Interesting blog, I'm going to start following it. I'm signing up for Las Vegas Rock and Roll so this post got me kind of pumped for it!